A skinny young man with a mop of dark hair takes the stage at a 2012 TEDx event. His name is Boyan Slat and he’s on a mission to rid the ocean of plastic. The audience listens in rapt silence as 18 year-old Slat lays out his concept for a device that captures plastic garbage passively before diverting it into a collector using the ocean’s currents. Maps of the five gyres—massive current systems that circulate water in the major oceans—flash on the screen. The goal, Slat explains, is eventually to clean all the oceans, starting with the “Great Pacific Garbage Patch, a stew of nearly two trillion pieces of plastic swirling endlessly around a region twice the size of Texas. The video immediately went viral, racking up millions of views. The toxicity of YouTube commenter culture was largely drowned out by cries of “Why aren’t we funding this? !” As if in response, a crowdfunding campaign launched several months later netted about 2 million dollars in 100 days. The Ocean Cleanup Project was born. Seven years later, Slat is a Thiel Fellow, a UN Champion of the Earth and a media darling. He has the backing of the Dutch government and powerful private investors including the CEO of Salesforce. His nonprofit has approximately $35 million dollars in funding. And yet, when the Ocean Cleanup Project finally launched its first prototype—a 2000-foot U-shaped boom called Wilson—into the North Pacific Gyre last September, it largely failed to collect plastic. For Slat, this was a minor setback, “teething troubles” that would be overcome with a better system. While a spokesperson for Ocean Cleanup did not tell Earther what specifically that better system might look like, the company plans to release a fleet of 60 of them. Despite its recent failure, it estimates these collectors will trap half the plastic in the North Pacific Gyre in five years. “We’re all convinced we’re doing the right thing,” Ocean Cleanup COO Lonneke Holierhoek told Earther. But many scientists aren’t so sure. For years, researchers and ocean plastic activists had been warning that The Ocean Cleanup Project’s fundamental assumptions were misguided. 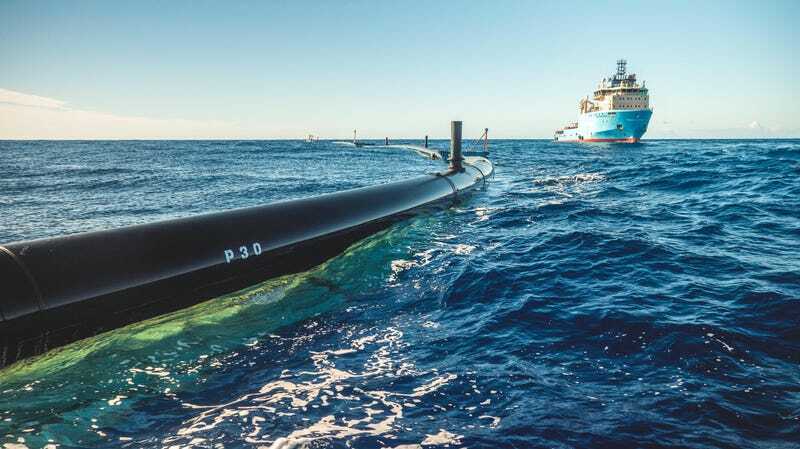 Instead of testing those assumptions in smaller, more controlled experiments, oceanographers and marine engineers claim that The Ocean Cleanup Project rushed to launch build and launch prototypes. Their concerns, however, have gone largely unheeded by award committees, The Ocean Cleanup Project, and the mainstream press. By December, a 60-foot chunk of the boom had broken off in calm seas due to “material fatigue.” Wilson the garbage collector was now ocean garbage. Shortly after New Years, the system was limping back to Hawaii for repairs. In hindsight, these issues were predictable, according to Craig McClain, Executive Director of the Lousiana University Marine Consortium, who called the entire endeavor a “boondoggle” in a recent article in Deep Sea News. McClain noted that a pair of oceanographers, Kim Martini and Miriam Goldstein pointed to possible structural flaws with the boom system in a detailed peer review of the Ocean Cleanup Project’s plans back in 2014. In that same review, Martini and Goldstein also cited inadequacy in the initial prototype testing, and noted that the project hadn’t adequately considered how fish or plankton would be affected. (The Ocean Cleanup has since conducted an environmental impact assessment of its system.) Martini and Goldstein recommended that the project extensively test the smaller prototype system before scaling up. “The only response we got from Cleanup was that we were not engineers,” Goldstein, who spent years studying Pacific ocean plastic and plankton before becoming Director of Ocean Policy for the Center for American Progress, told Earther. Martini, a physical oceanographer who specializes in designing scientific instruments to survive at sea, offered an even blunter assessment. “They just blew us off,” she said. A spokesperson for Ocean Cleanup told Earther that the organization takes criticisms seriously. “We’ve taken it so seriously that the design is completely different,” the spokesperson said. Indeed, the group has updated its initial design extensively from the 2012 concept of a moored, manta ray-shaped microplastic collection installation. The current system, which was modified after extensive testing, floats freely, and is much smaller than the device originally proposed. But Martini and Goldstein aren’t the only scientists who feel their concerns went unheeded. Nor has critique been limited to structural issues, but whether the proposed system could collect plastic at all. When shark conservationist (and occasional Earther writer) David Shiffman asked 15 self-selected ocean plastic pollution experts for their take on the project, most voiced major reservations about its effectiveness. Experts doubted that the design could capture plastic, or avoid harming wildlife. The fundamental issue at hand is that cleaning up ocean plastic pollution is complex. Intiutively it should work like a park cleanup, except one where the trash is in constant motion, where waves, wind and sun conspire to break much of the litter down into microscopic fragments, and where storms and wind have churned garbage hundreds of meters below the surface. According to a 2015 study, only a tiny fraction of the plastic at sea is actually floating on the surface where floating booms can corral it. The Ocean Cleanup Project’s own published research acknowledges that most plastic isn’t on the surface, but the organization contends that surface plastics are are doing the most harm and deserve attention. There is some merit to that claim: Ocean Cleanup’s study found that 46 percent of floating plastic is actually discarded maritime equipment, including deadly driftnets. Holierhoek, COO of Ocean Cleanup, says that their project is just one part of a broader solution. On the other hand, it’s also possible going after the estimated 1 percent of ocean plastic that lingers at the surface might do more harm than good. The surface of the Pacific Ocean is home to a mysterious community of floating life, called neuston. Like floating plastic, the neuston is largely at the mercy of wind and waves. Floating lawns of blue buttons feed hungry, nocturnal fish and paper nautiluses. Tiny, “blue dragon” sea slugs feed on jellyfish. Anemones, barnacles and snails drift on bubbles, sometimes in giant rafts. Many also happen to superficially resemble and act like drifting plastics. Unlike plastic, these animals are delicate. They may not survive contact with a Wilson-style plastic collector. Given the neuston’s role as a nursery for certain fish and the fact that it exists within a complex, pelagic food chain, damage to it could ripple across ecosystems and ultimately, to our dinner plates. Rebecca Helm, a marine biologist specializing in jellyfish, found it troubling that the neuston was not explicitly called out in The Ocean Cleanup’s environmental impact assessment. “By omitting the neuston from its assessment, the project is overlooking the habitat it could be impacting most, and there is no sense of what the damage might be,” Helm wrote in a recent article in the Atlantic, adding that the ocean gyres where neustonic ecosystems develop are likely to be “precisely where” The Ocean Cleanup plans to deploy its devices. “We can’t clean ocean plastic in spite of the animals where the plastic is,” Helm told Earther. In response to Helm’s criticisms, The Ocean Cleanup published a blog post noting that a number of neuston species are included in its environmental impact assessment, including certain types of jellies. The Ocean Cleanup emphasized the “ubiquitous” nature of these species, however, the papers it cites to support that claim do not focus on the North Pacific and actually show the opposite. The organization added it plans to “study the interaction between the system and the local environment” before scaling up. While The Ocean Cleanup’s current environmental impact assessment covers a single device, it told Earther it is planning to do a larger environmental impact assessment before scaling up. Perhaps the biggest concern for ocean plastic advocates is that the focus on entrepreneurial technological solutions like this is ultimately a distraction. Ocean plastics researchers and advocates are pushing to stop plastic from ever reaching the water. The EU just unanimously passed a ban on single-use plastics like cutlery or takeout containers. Zero-waste initiatives have seen massive success in The Philippines. Global beach cleanups and harbor cleanups have prevented millions of tons of plastic from reaching the deep sea. In spite of the criticisms and setbacks, the Ocean Cleanup plans to go back out and try again. The organization told Earther it would be conducting a technical assessment of Wilson’s failure, and hopes to relaunch in a year. It isn’t hard to see why The Ocean Cleanup took off. Slat’s initial pitch was full of homespun earnestness, from kids centrifuging samples of water to separate plastic from plankton to kids paddling surfboards while dragging nets. And the company’s subsequent growth shares plenty of elements with other Silicon Valley success stories: A “revolutionary” technology; a wunderkind dropout inventor; a savvy marketing campaign; entrepreneurship with a soul. But the same buzz that secured Ocean Cleanup a network of powerful backers might ultimately be its undoing. Eriksen, who used to work with Ocean Cleanup on scientific research projects in the past but is now openly critical of their approach, noted that while skepticism grew, The Ocean Cleanup Project simply chugged along, collecting donations from corporate sponsors and environmental awards for a promise they probably couldn’t keep. Vincent Gabrielle is a freelance science journalist based in Boston. Correction: This article’s headline has been corrected to remove the claim that The Ocean Cleanup’s plan emerged on Kickstarter, as originally stated. Miriam Goldstein’s former title has also been corrected, and the article has been updated to include context regarding the research The Ocean Cleanup cites to support its claim that neuston species are ubiquitous. Just How Big Is the Great Pacific Garbage Patch? What Does an Equitable Plastic Bag Ban Look Like?